The OFERA Project is an EU Funded project creating an extension of the Robot Operating System for microcontrollers: micro-ROS. 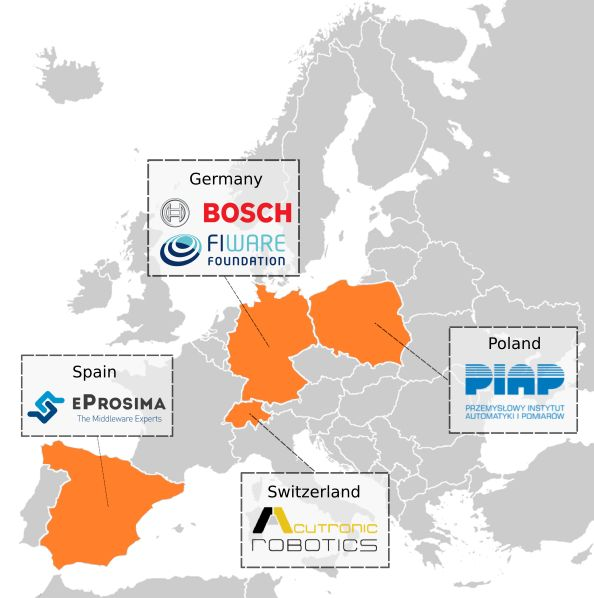 Enable European companies to rapidly deliver robotic products integrating highly resource-constrained devices, to contribute to the faster growth of a competitive industry of small robots and robot components manufacturers. OFERA bridges the technological gap between the established robotic software platform for high-performance computational devices and the low-level libraries for microcontrollers. By doing so, microprocessors and microcontrollers could be mixed together seamlessly in any robotic system. Through the end-user driven development of this innovative platform, we aim to substantially reduce the cost of initial investment in robotic systems and thus lower this market entry barrier for smaller and medium-sized companies. The SPARC Robotics PPP Strategic Research Agenda for Robotics in Europe [SRA] formulates three strategic objectives. These include to strengthen EU’s technical and scientific position as well as industrial leadership in innovation. Regarding communication, the SRA further formulates the 2020 target to accommodate robot requirements into widely used communication protocols and to integrate heterogeneous communication systems to improve data integrity and coverage. The Robot Operating System (ROS) and OFERA together will be major pillars for achieving this target: The upcoming ROS 2 is based on the mature communication standard DDS, which is backed by established suppliers, whose implementations provide interfaces to a variety of other communication protocols. OFERA will ensure that the many benefits of the de-facto standard ROS and the DDS communication standard do not stop short of resource-constrained computing platforms as used in many commercial and industrial products. This project has received funding from the European Union‘s Horizon 2020 research and innovation programme under grant agreement No 780785. The project started in Jan 2018 and will end in Dec 2020. The opinions expressed on this website reflect only the author‘s view and reflects in no way the European Commission‘s opinions. The European Commission is not responsible for any use that may be made of the information it contains. The OFERA consortium consists of a diverse mix of partners from small to multinational companies as well as from academia to an EU-wide acting foundation. This diversity will ensure a broad spectrum of requirements and use cases for the outcomes of this project.